Happy February! My big girl is now 6! She had a Ninja Party. But true to form, she made a last minute change of clothes from her ninja out fit to her dress. 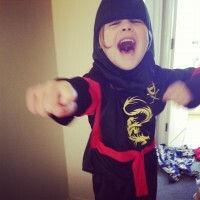 So I like to call her my Ninja princess. It was really cool, her friends dressed up and we had some helium balloons with ninja eyes on them the kids could hit and kick, which the boys especially loved. A big Thank You to you, yes you for subscribing to The Parentalist! I had a look in iTunes today for the first time in about a month, and there we are! In New Zealand we’re in the What’s Hot section for “Business” “Education” and Kid’s and Family. And for USA if you click on Kids and family and do a few scrolls you can spot our logo there too. So thank you so much for helping us be noticed, I really appreciate it. Labon B. Jones “ Great guests and great questions for those guests. Keep up the great content. very interesting topic and one that all parents would do well to give a listen. You may have noticed we had a last minute switch last week. I learnt so much from Christina Lattimer last week. She featured The Parentalist in her online magazine eMile so feel free to check it out. Her grandson was having a birthday the last weekend too. This week I’ve been on jury service, so that’s why it’s the night before tomorrow’s release – eek! Running it a bit close! or Just in time! as I like to say! So tomorrow we have a superb man whose book has launched as the #1 parenting book in America and was great to talk to. The amazing adventurer I’ve been looking forward to releasing will be following that. Next we have a Entrepreneur who’s staff live in NZ but he actually lives with his family in France, so we learn how that works. Finally we end the month with a Superb Man who Andrew and I met last year when we decided to invest in our marriage and thought straight away we needed to have on our show. So I know you’ll be inspired from these amazing Dads this month. So just a quick update, I’ve decided I’ll keep The Parenalist as an audio podcast and leave off the video and YouTube and also Warm Fuzzies. Although they are sweet and fun, unfortunately I’m not finding the time to do everything really well. So with focusing on The Parentalist, I can make sure the content is always good and I can stay fresh. If you haven’t found us on twitter we’re the_parentalist and on facebook The Parentalist. Just look for our logo and you’ll be right. Have a great week and I know you’ll be inspired as much as I have by our awesome guests this month – super excited!! !